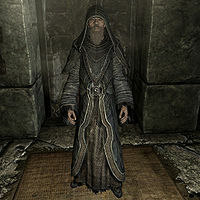 Einarth, an elderly priest, is one of the Greybeards living at High Hrothgar. He will teach you the second word of the Unrelenting Force shout. At the end of the quest Alduin's Wall, Einarth can be heard lecturing Arngeir when the latter refuses to help you in your quest to learn the Dragonrend shout, saying: "Arngeir. Rok los Dovahkiin, Strundu'ul. Rok fen tinvaak Paarthurnax." Einarth wears a set of Greybeard's robes with the matching hood and boots. He carries a copy of the book Dwemer History and Culture, a bottle of Black-Briar Reserve, a horker tusk, one sample of juniper berries, and three leather strips. He knows the following shouts: Disarm, Dismay, Elemental Fury, Fire Breath, Frost Breath, Ice Form, Unrelenting Force, and Whirlwind Sprint. Of the Greybeards, Einarth has the lowest level of 90. Wulfgar and Borri are at level 100, while Arngeir is level 150. This page was last modified on 6 May 2016, at 19:52.